Are you looking for a way to streamline your operations? One great way to simplify the organization of your documents while providing quick and easy access to critical files for the people who need them is through the use of digital business document services. If you’re an older company or a newer company that has generated a lot of paperwork very quickly, you may have storage rooms full of document boxes. This is not only a waste of space — it creates a very time-consuming process when one of your personnel needs to access one of those documents. If this sounds like your office, you are a great candidate for business document conversion services. In today’s digital marketplace, more companies are moving everything they can from the physical space to cyberspace. While your company may not want or need to be fully online, the benefits of digitizing at least your backup documents is incontrovertible. 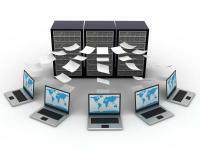 By digitizing your business documents, Aegis IT can help you reduce your document storage. You’ll no longer have any need for all those paper documents because we can store everything securely in the cloud, then set up a system to easily scan future documents into your digital storage. Once we have digitized your documents, you, and anyone else with permission, can access them almost immediately anytime you want, from anywhere. While your competitors might be wasting days combing through files looking for what they need, you’ll have it at the click of a button. When tax time comes and you need to make sure you have all the necessarily files in one place, you’ll know exactly where to find them online, giving you instant peace of mind. And Aegis IT Services offers 24/7 support, so if you have any questions or concerns about your documents, you can always contact us. If you’ve had concerns about finding an effective backup for your documents, accessing your documents or storing your documents, Aegis IT Services has your all-in-one solution. Businesses prefer working with Aegis IT Services because we are a straightforward company that doesn’t try to bog down our clients with a lot of tech-speak. We understand your needs and can explain how we will meet them in layman’s terms, and we don’t proceed unless we’re satisfied we’ve explained our service to your satisfaction. But don’t just take our word for it. To find out more about how we can make document digitization work for you, or to order our services right away, give us a call now at 717-202-2607 or send us a note online.